At the contract signing between IFC and Insular Life from left: Marianna Pacua, IFC Operations Analyst, Financial Institutions Group (FIG); Geraldine Pascual Insular SAVP; Conrad de Jesus, IFC Operations Officer, Advisory Services Lead for the Philippines, FIG; Aileen Ruiz-Zarate, IFC Senior Investment Officer and Hub Lead for the Philippines, (FIG); Marieme Esther Dassanou, Senior Operations Officer, Gender Secretariat; Yuan Xu, Country Manager, IFC Philippines; and from Insular Life, Nina D. Aguas, CEO; Mona Lisa B. de la Cruz President and COO; Noemi Azura, SVP and Chief Strategy Officer; Famida Alonto Chief Innovation Officer; and Atty Rene de Jesus, Corporate Secretary. Insular Life and IFC sign agreement to The Filipino "SHEROES"
Insular Life, the first and largest Filipino life insurance company, and the International Finance Corporation (IFC), a member of the World Bank Group, recently signed a partnership agreement to educate and offer risk-mitigating solutions to relatively untapped women segment in the Philippines. A 2015 report released by IFC entitled “She for Shield: Insure Women to Better Protect All”, showed that the women segment represents an untapped US$1.7 trillion opportunity, most of which come from emerging markets. Since the report, IFC has been exploring partnerships with innovative insurance companies in different countries interested in and committed to profitably increase the uptake of insurance by providing customized risk mitigating solutions for women. 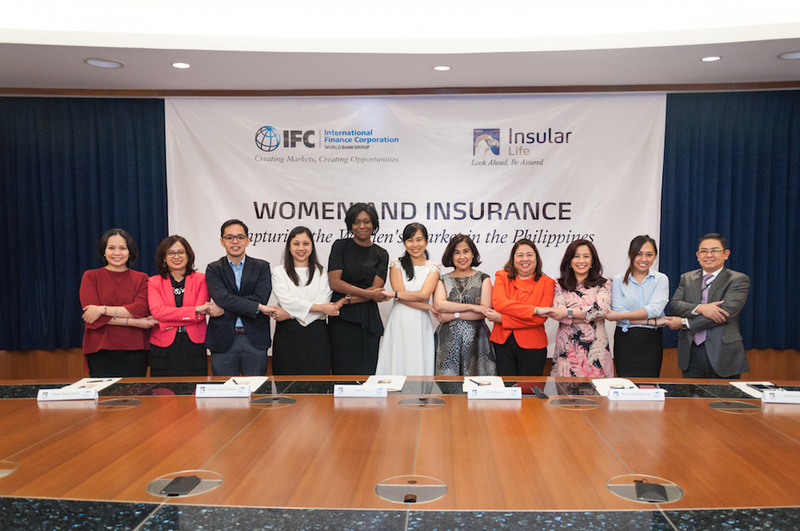 For the Philippines, Insular Life has taken on this call from the IFC, and as such, it is also the first insurance company in Asia to partner with IFC on this program for insuring women. Dubbed “Empowering the Filipino Sheroes” , the program aims to reach out to the entire women segment of the population -- the career women, the professionals, the entrepreneurs, and most especially the women who are looking for financial solutions to expand their businesses or those who seek life protection, but currently have no access to financial instruments and life insurance. The program will involve developing insurance products specifically designed for women, through specific coverage, bundling of insurance products, awareness campaigns, and developing add-on services.